Can’t get enough of Avengers: Infinity War? 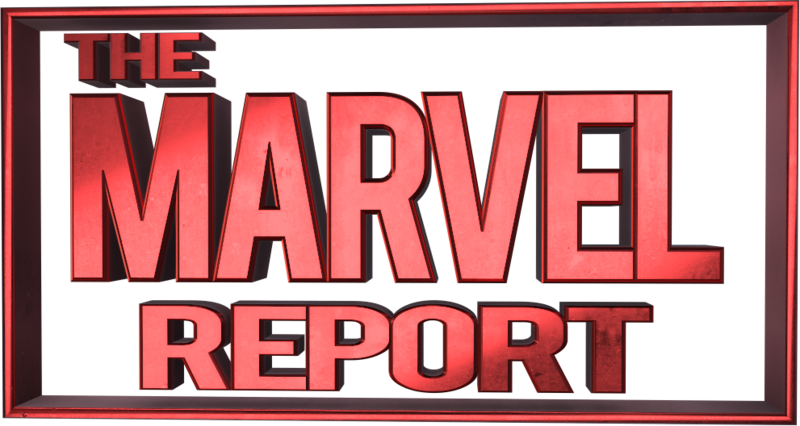 Do you want to show your Marvel pride while looking great? 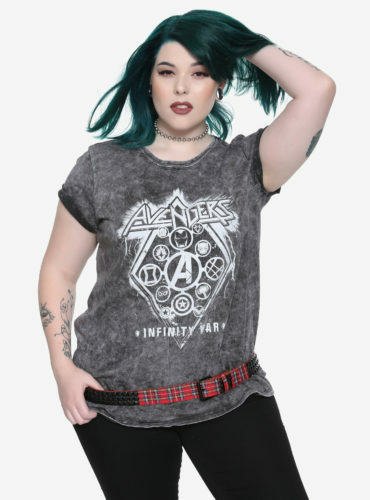 Well the fashion brand Her Universe founded by actress Ashley Eckstein has a women’s athletic line that shows your Infinity War love, complete with makeup and accessories. Each piece in the collection represents one of the Infinity Stones in Thanos’ gauntlet. This collection is at Hot Topic stores and online. Some pieces are at Her Universe and Box Lunch stores and online. 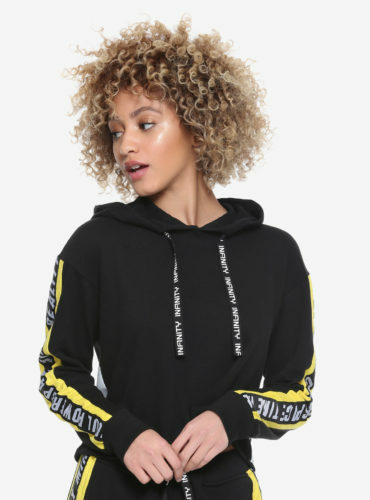 Below is the Mind Stone crop hoodie. It has yellow stripes on the sleeves with white writing on black that lists all the Infinity Stones, “soul, power, space, time, reality”. 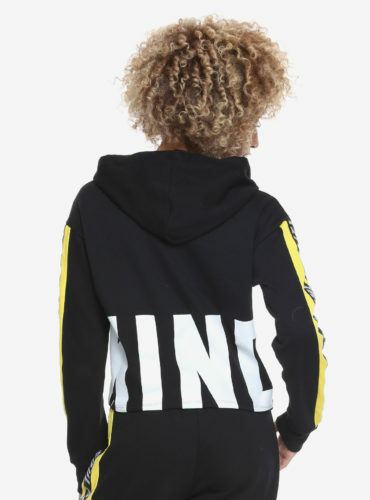 The drawstrings on the hood say “Infinity”, and on the back the hoodie says “Mind”. 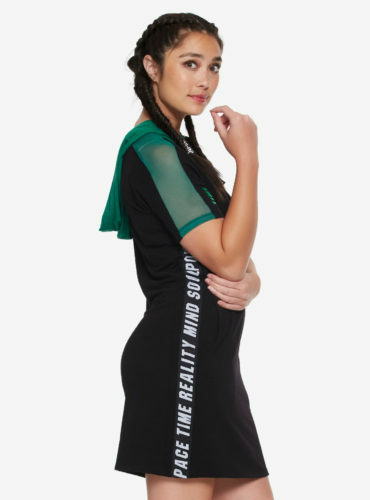 This comes in plus size as well and can be found at Hot Topic stores, HotTopic.com and HerUniverse.com. A grey crop top embodies the Soul Stone. The shirt is cotton and polyester so it is basically a crop t-shirt; perfect for exercising in or just hanging out. 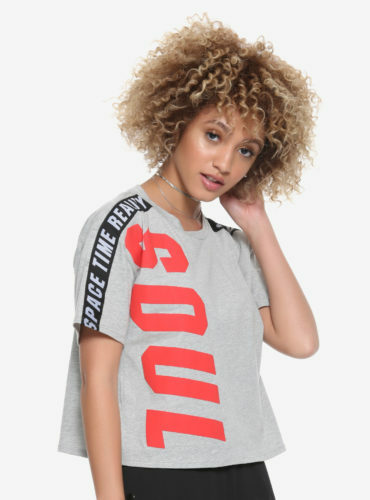 “Soul” is written in red down the right side of the shirt. 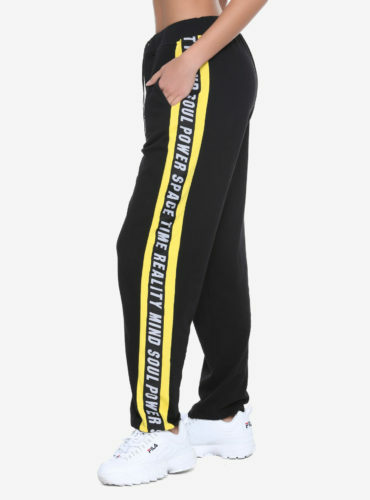 On each sleeve are black stripes with white writing saying “space, time, reality” on one side and “soul, power, space” on the other. 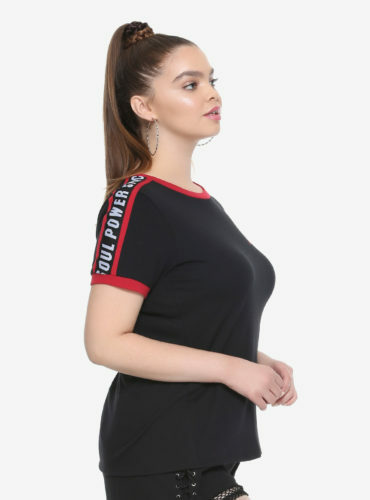 This top comes in plus size and is available at Hot Topic stores, HotTopic.com and HerUniverse.com. These are the Infinity Stones low impact sports bra and biker shorts. They are separates, but go together in concept and style. The sports bra is black spandex and nylon with gold foil circuitry on the front, sides and back. the straps are black with white writing, naming the stones. The straps go into a racer back on a triangular ring in the back. 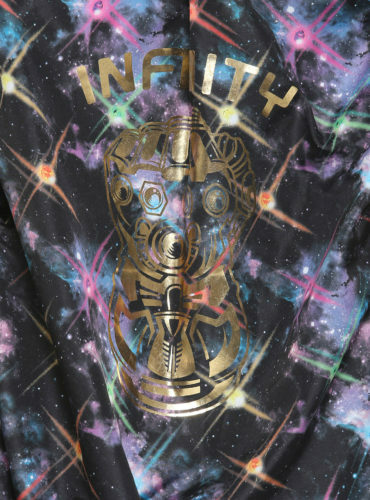 On the back on the bra, bottom middle is the word “infinity” in gold. This sports bra does not come in plus size. It can be bought at Hot Topic stores, HotTopic.com and HerUniverse.com. 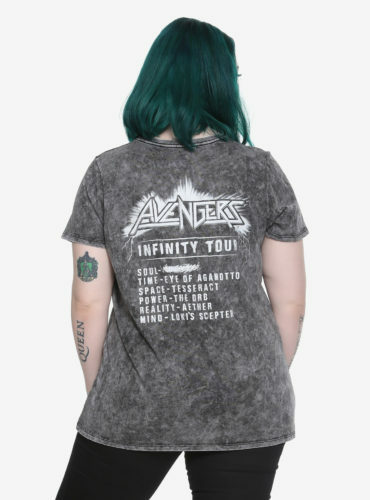 Below is the Infinity War girls tour t-shirt. It is a retro gray t-shirt with all the Avengers’ symbols on the front and on the back is where in the MCU each of the Infinity Stones are located. Both the graphics and faded quality of this shirt give it the feel of a band’s tour shirt. 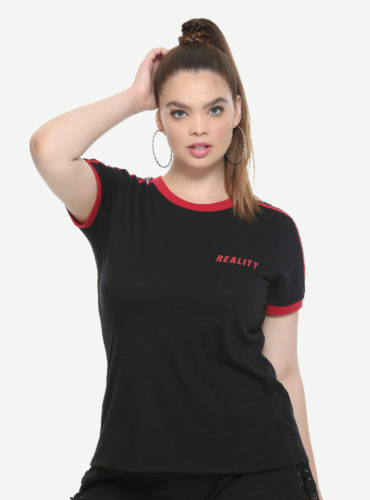 Hot Topic stores and HotTopic.com have this shirt in plus size. This shirt is available at HerUniverse.com as well, but the sizing only goes from XS-3X, no plus size option.